Oodles of Zoodles, Coconut Oil, Capers, Crushed paper, Octopus + Krispy Kale. I have committed to create more than I consume. to continue capturing my best self thru my creative feats. A fitness concept to start — an open canvas to connect to others as I connect to myself. To force feeling, vulnerability, open up + dig in. cooking is also creating. connecting to the craft of food shared + consumed. to fuel my body instead of fill it - with creativity, with connection. Oodles of zoodles with coconut oil, capers, crushed paper, octopus + Krispy kale. tenderly twirled to chopsticks, before messily slurping excess juice bowl to mouth + finished with fingertips wiped down the sides. creativity just tastes better. The process, the journey almost more enjoyable then the outcome. But this was pretty damn good. recipe below. Remove as it begins to brown, just before it burns. 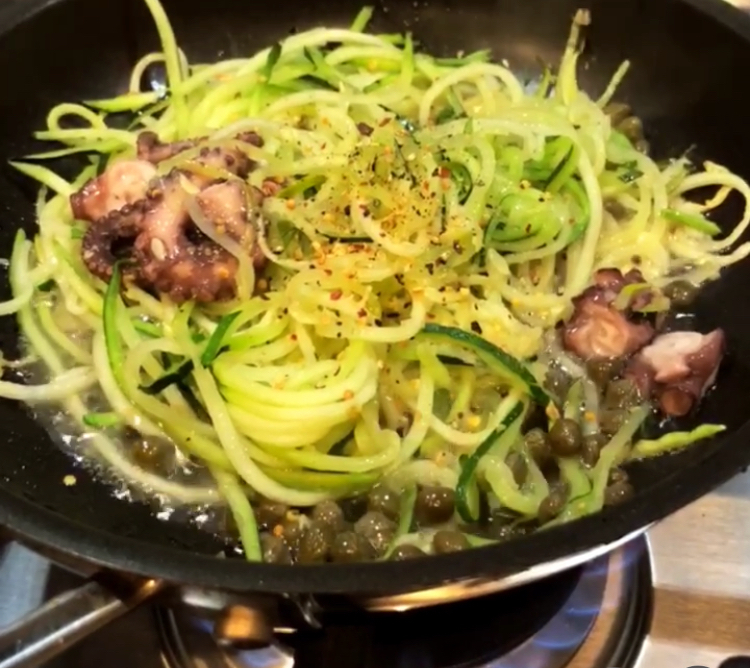 Serve atop zoodles. The process, the journey almost more enjoyable than the outcome. But this was pretty damn good.